Katie has been visiting our Wednesday afternoon group with her mom this summer. Her mom taught her to knit early on her summer vacation, and our regular group members have been pleased to watch her progress as she has knitted a bow for her hair and a couple of cute tops for her stuffed animals. Well, the only thing to do was to enhance this young knitter's stash straightaway. 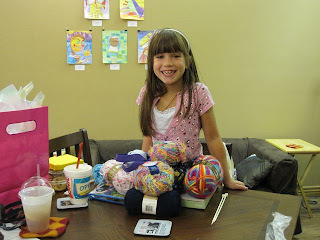 So each group member gave Katie a ball of yarn, a book, or a notion for her knitting bag. Now she is ready to face the school year with plenty of projects. With each day I'm surprised by the generosity of our little community. How we encourage and care for each other! It's a beautiful thing. And twist the center of the good-heartedness! What a lovely story! thanks for posting!